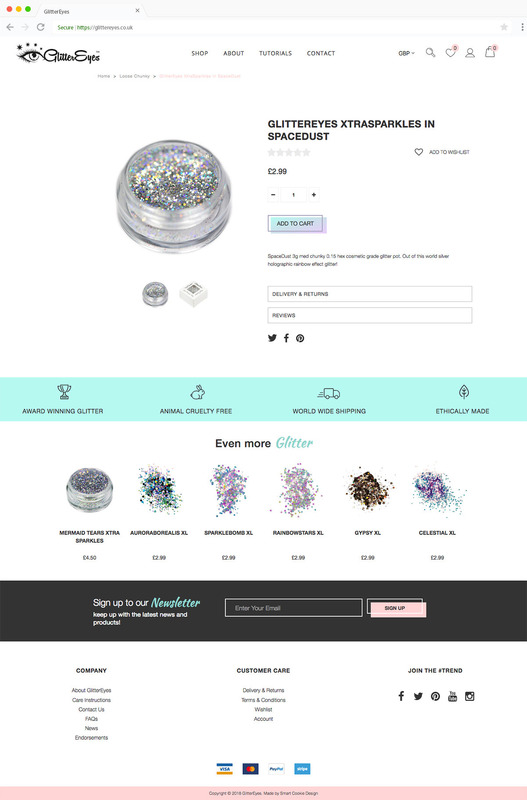 "We bagged our first big high street client straight after the launch of the website..."
GlitterEyes retail a variety of glitter orientated products and cosmetics and over the last 4 years have created a loyal following of customers. 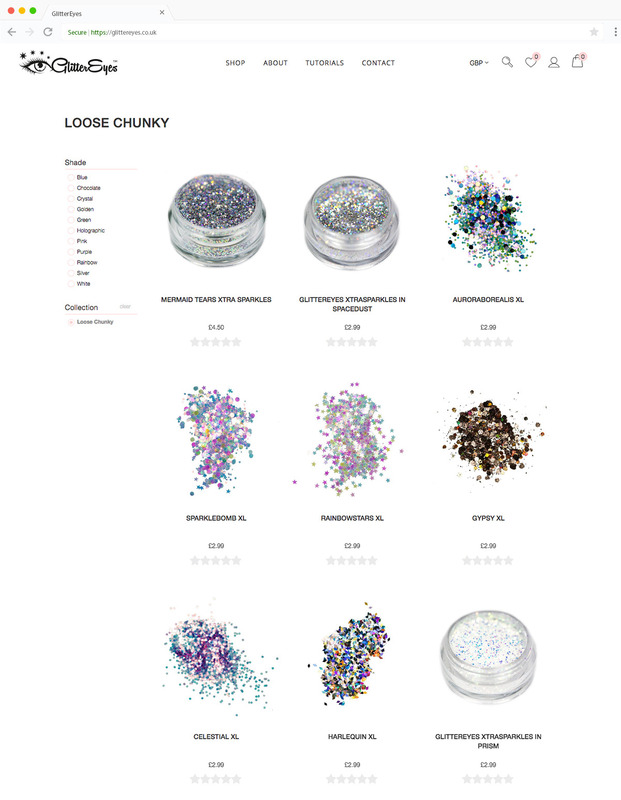 There growth on social media has supported the company from strength to strength who now retail over 130 shades of cosmetic glitter. Their previous WooCommerce site was no longer performing to their requirements with the whole site needing a complete revamp. Security flaws on their servers also meant significant downtime for the company so they looked to Shopify for a secure infrastructure they could rely on. GlitterEyes were also looking for a team they could rely on with a personal approach to project management. The team at GlitterEyes chose our team to design and build their new store after detailed discussions about the brands aims and ambitions. A complete new look was crafted and developed for the brand with the aim of increasing market share whilst creatively showcasing their brands image. Our team migrated all the original WooCommerce products, customers and orders to Shopify seamlessly whilst integrating a filtering system for easy navigation of the product ranges. Shortly after launch a large high street retailer agreed to stock the GlitterEyes range of products. Michael and his team were highly efficient, helpful, clear and concise with all instructions guiding us through a very smooth transition from our old wordpress platform to the shopify one. I am over the moon with the design and feel of the new site, it is exactly what I had in mind. As a bonus we bagged our first big high street client straight after the launch of the website and I have no doubt that the website helped to give the correct image we wanted to portray to larger retail clients and contributed to this success.